Belated Birthday Wishes for Wife: Forgot your wife’s birthday? Making up to her will not be easy but you can start by writing a sweet and apologetic quote on a greeting card. Follow it up by posting cute messages on her Facebook, sharing romantic pins on Pinterest and tweeting your apology on Twitter – and add a bit of humor to your wishes to add a funny twist to the situation. Accepting your mistake in front of everyone will make her realize that you are really sorry for forgetting her birthday. Shower her with the best gifts and keep pampering her with your love until she forgives you. Show her that you may be forgetful, but you are still the same husband who will go to any lengths to win her heart all over again. 1) I’m late, I made you wait. I know, I’ve been slow. Please forgive me, I love you baby. Happy birthday. 2) The fact that I have forgotten my wife’s birthday is proof that I don’t think she is getting any older at all. Happy belated birthday. 3) I know I made a terrible mistake by forgetting the birthday of my missus. But I promise to heal her wounds with my hugs and kisses. 4) Birthdays will come and go, my dream to make you the happiest woman in the world will live on forever. Sorry I am late, happy birthday. 5) How I managed to forget your birthday I will never find out, but I will regret this for a long time… of that I have no doubt. Happy belated birthday. 6) I don’t know how I will make up to you for forgetting your birthday, but I do know that I will keep trying until the smile comes back on your face and the happiness comes back in our marriage. Happy belated birthday. 7) Your husband doesn’t have a strong memory but he assures you that he has the strongest hearts… which keeps beating for you all day and all night. I love you, happy belated birthday. 8) I know I’ve forgotten your birthday but I hope you’ll give me credit for being a good husband all year round. Happy belated birthday. 9) Since the King of this household has forgotten the birthday of his Queen, he is officially demoted to the position of the Queen’s butler for the next one month. Belated happy birthday, your highness. 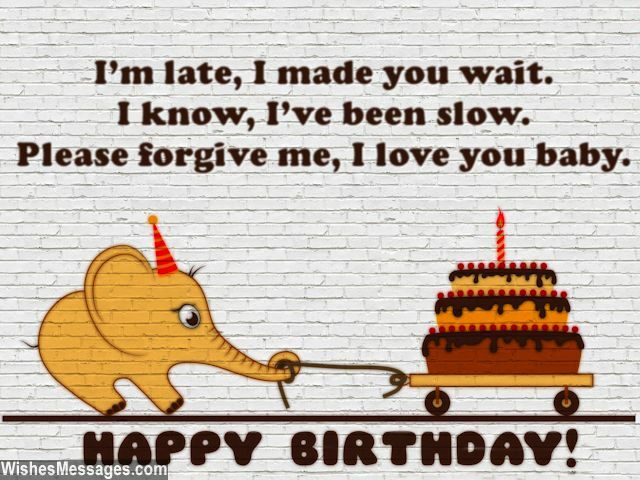 10) I was so busy loving you, I just forgot wishing you… happy belated birthday. 11) I may have failed at remembering a date, but I promise that I will never fail you as a husband. Belated happy birthday. 15) I wonder how I forgot your birthday… especially when my heart never forgets to beat for you even for a second. Happy belated birthday. 16) Please tell me what I can do, to make up to you. I’ll do whatever you say, I’ll pamper you in every way. I’m on my knees, begging for forgiveness. I’m sorry, I robbed you of your happiness. Happy belated birthday. 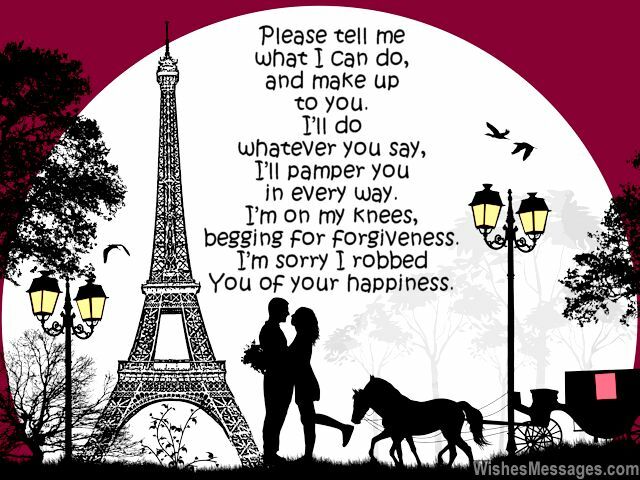 17) I will plead, request and beg until eternity… if that’s what it takes for you to forgive me. Happy belated birthday. 18) Your husband may be forgetful but he is still the man who will do anything it takes to make you happy. Please forgive me. 19) In wishing you for your birthday, I know I’ve been slow and late… but don’t forget that Slow and Steady always wins the race! Happy belated birthday. 20) I had fever so I went to the doctor who revealed that I am suffering from a mild infection of Forgetfulness and strong bouts of Guilt. He prescribed two medicines – Wife’s Forgiveness and Wife’s Love. Happy belated birthday. 21) I don’t need air to live as long as I can see that beautiful smile on your face. Please stop suffocating me and smile again… so that I can breathe again. Happy belated birthday. 22) Being the judge of my own life, I pronounce myself guilty of forgetting your birthday. I am charged for the crime of Forgetfulness and punished by sleeping on the sofa for one full month. Sorry. 23) Because it is everlasting and eternal, my love for you has no sense of time or date. Maybe that’s why, I innocently forgot your birth date. Happy birthday. 24) I forgot your birthday, I confess. But that doesn’t mean, that I love you any less. Please give me a chance, to clear up this mess. Happy belated birthday, my princess. 25) I forgot your birthday because I was busy thinking about how to give my wife… the perfect life. Muah. 26) Your husband has always loved you like there’s no TOMORROW. Maybe that’s why he forgot your birthday YESTERDAY. Belated happy birthday. 27) Forgiveness, generosity, kindness, thoughtfulness and sympathy – these are the best things that I like about your personality. I hope you will be true to your own self… and forgive your husband who is reeling and suffering in guilt. Happy birthday. 28) I never expected myself to forget your birthday, but I still did. You don’t expect yourself to forgive me for this, but I hope that you still do. I am sorry. 29) I know I have committed the biggest mistake by forgetting my wife’s birthday. But I hope I get some concession for treating her like a queen for the other 364 days in the calendar. Happy belated birthday. 30) I officially give up the right to hog the TV remote from today. I hope you will forgive me now. Happy belated birthday. 31) My forgetfulness is rare, but our love is rampant. My wishes are belated, but our bond is constant. Happy belated birthday. 33) I may have forgotten your special day… but I promise to make it up to you by making the rest of the days in the year extra special. Happy belated birthday. 34) Do you know what romantic dates, long drives, lavish shopping trips, long massages at spas, late night movies and weekend picnics have in common? We are going to be doing all of that in the coming weeks as I pamper you to make up for forgetting your birthday. Muah. 36) I can’t turn back time but now, I promise I’ll do everything to show you a good time. Happy belated birthday. 37) I won’t say anything at all. I just want you to look deeply in my eyes and put your hand on my heart… you’ll realize that forgetting your birthday was an innocent mistake for which I am suffering in pain. Happy belated birthday. 38) Since our marriage is so perfect, maybe the Gods wanted me to forget your birthday so we could have at least one fight in the whole year. I love you, happy birthday. 39) Nothing can change the fact that I am a forgetful jerk. But I hope that our love can still make things work. I’ll do everything I can to make up for forgetting your birthday… from parties to gifts, baby I’ll pamper you in every way. Happy belated birthday.